Knowledge@Wharton technology and media editor Kendall Whitehouse recently returned from San Diego Comic-Con where he explored some of the marketing activities that took place at the event and considers what they may indicate about the future of virtual reality for advertising and entertainment. Each year, media and entertainment companies descend on San Diego with large-scale marketing initiatives in hopes of impressing the 130,000-plus fans in town to attend Comic-Con International: San Diego. In addition to the official events at Comic-Con — the celebrity-filled panels, the exhibits on the show floor, the annual costumed masquerade — the area surrounding the Convention Center is filled large-scale advertising displays, typically referred to as “activations,” promoting current or forthcoming movies, TV shows, and video games. In an effort to stand out in this crowded field, media companies pull out all the stops in hopes of thrilling the crowds at the four-and-a-half-day pop culture festival. In doing so, they may also provide a glimpse of the future of immersive, interactive advertising. For the past several years, virtual reality has been a growing component of these marketing experiences. This year VR was back in a big way and evinced a number of emerging trends in the field: blending virtual experiences with real-world environments, exploring the alternatives of interactive versus cinematic virtual experiences, and broadcasting these virtual experiences beyond the scope of the con. 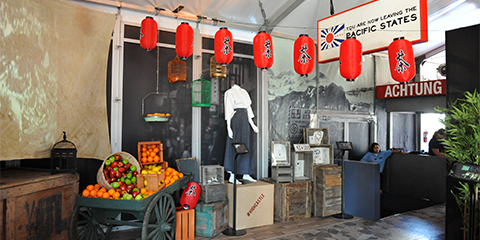 Marketing events based on large-scale constructed environments have a long history at San Diego Comic-Con. Longtime fans still tell tales of playing retro video games at Fynn’s Arcade, a reconstruction of the video parlor featured in the movie Tron, at the 2009 and 2010 San Diego Comic-Cons. In 2013, fans could walk through an environment filled with costumes and props from Lionsgate’s forthcoming film Ender’s Game. That same year, Legendary Pictures converted a 10,000 square foot building in San Diego’s Gaslamp Quarter into the Godzilla Encounter, which included a reconstruction of a Tokyo street scene — complete with a person eating at a noodle bar. Exploring the environment also provided a glimpse of creature itself, viewed out the window courtesy of a large video screen. 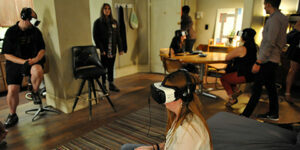 By 2014, many of these experiences had gone virtual. That year, VR headsets let fans ascend the Wall of Westeros from Game of Thrones, enter the Cerebro from X-Men: Days of Future Past, pilot the giant robot from Pacific Rim, or experience getting virtually decapitated by the Headless Horseman from Sleepy Hollow. This year, virtual reality was even more prevalent. While two years ago, VR experiences required the use of relatively high-end equipment, the arrival of consumer grade VR technology such as the Samsung Gear VR (powered by Oculus), the HTC Vive, and VR apps designed for cellphones and Google’s Cardboard viewer have made virtual reality more readily available. As virtual reality experiences become more common, it raises the stakes for marketing firms hoping to create one-of-a-kind experiences for the fans who trek to San Diego for Comic-Con. One approach taken by a number of companies this year was to blend a virtual world with a physical environment to create a richer immersive experience. To promote its streaming video series, The Man in the High Castle, Amazon.com first led viewers into a physical environment inspired by the show. In addition to housing artifacts from the show, the environment included partial cityscapes from the program. After exploring this environment, participants entered an elevator-like enclosure, donned an HTC Vive headset and grabbed a pair of controllers. As the elevator in the virtual experience moved, the seat vibrated to enhance the perception of motion. Using the handheld controllers, participants could move through several locations from the series, looking for clues to a mystery. A representative from NVE, which developed the experience for Amazon, explained the virtual environment was created by digitally capturing the actual sets used in the video production. A few blocks away, the TV series Mr. Robot also featured a physical environment to add context to a virtual experience. Facing the street was a reconstruction of the Mr. Robot computer repair shop featured in the show, replete with mid-1990s era computers. After exiting the rear of the repair shop through a short corridor, visitors arrived at an accurate reconstruction of the apartment of the show’s protagonist, Elliot Alderson. Arrayed throughout the room were objects familiar from the TV show: Elliot’s computer (complete with the logo of the show’s fictional E Corp), computer circuit boards, and other minute details such as bills from New York City utility companies. After taking a seat and donning the Samsung Gear VR headsets, the virtual reality experience began. The simulation begins in Elliot’s apartment. In other words, you enter a virtual space that looks very much like the physical location in which you’re sitting — except that when you turn your head, there’s Elliot, played by Rami Malek, sitting next to you. Entering the Mr. Robot VR Experience from inside Elliot’s apartment. The 13-minute video, directed and written by Mr. Robot creator and showrunner Sam Esmail and produced by Here Be Dragons and Within for USA Network, places you inside Elliot’s head, as you experience his recollection of his first date with former friend Shayla. The story moves through several locations: from the apartment to Coney Island, to an abstract dance sequence, to end back at the apartment once again. It also takes the viewer on an emotional journey as Elliot’s shifting memories replay moments from their history. Because the audience knows the eventual fate of their relationship from the storyline of the show’s first season, there’s significant emotional depth to this narrative sequence. The Man in the High Castle and the Mr. Robot activations illustrate two different approaches to virtual reality experiences: the interactive and the cinematic. The Man in the High Castle experience took an interactive approach, unfolding like a video game. Using game controllers, participants can interact with virtual objects while exploring the simulated environment. The open-ended nature of interactive video games, however, presents a challenge for location-based marketing events. One of the constraints of a system like this is the number of participants that can be served per hour. To keep the long lines at these events moving, the VR experience needs to be time-limited. A representative from NVE noted that the museum component is helpful to fill the time for people waiting to access the VR experience. The Mr. Robot experience, on the other hand, took a cinematic approach. While the viewer had the freedom to look anywhere in the 360-degree environment, the story followed a single narrative thread. At 13 minutes, the length of the Mr. Robot VR experience was noteworthy. To move people through the experience, most marketing-based VR pieces are relatively brief, typically ranging from around three to six minutes. ‘Mr. Robot’ cast members enter the show’s virtual world. The Mr. Robot VR experience was available a several venues at Comic-Con. In addition to the Mr. Robot shop/apartment environment, it was also shown to an audience at Petco Park, with cast members Rami Malek, Christian Slater, Portia Doubleday, Carly Chaikin, and Grace Gummer in attendance. The actors experienced the virtual reality content for the first time along with the fans. In conjunction with Uber, there were also vans driving around downtown San Diego — branded with the show’s Mr. Robot repair shop logo — showing the VR experience. Ultimately, the proliferation of consumer virtual reality devices may provide a way around the space and time constraints of these elaborate hybrid physical/virtual installations. During the Petco Park event at Comic-Con, the Mr. Robot VR presentation was also broadcast as part of what an NBC/Universal press release described as “largest-ever co-viewing virtual reality simulcast event.” Over 20,000 people remotely viewed the virtual experience during this event according to a representative from NBC/Universal. the 360-degree video has subsequently been made available for viewing online or for download on iOS and Android devices using the Within app and Google Cardboard or similar VR gear. This may indicate the future direction of these marketing experiences. While there’s an extra thrill from merging the virtual experience with physical environment, or sitting with cast members at a special event, if the same rich, immersive experience can be broadcast to mobile devices and VR headsets globally, event-based marketed may be freed from the tethers of physical location. It will be interesting to see what happens at San Diego Comic-Con 2017 to promote next year’s movies and television shows. A report on this year’s trends in entertainment marketing at San Diego Comic-Con, the largest U.S. convention celebrating the popular arts. Knowledge@Wharton technology and media editor Kendall Whitehouse explores the “marketing arms race” that is San Diego Comic-Con.